Task testing is a quick and simple step that generally follows card sorting in the process of building an intranet navigation. This guide will help you create a user-friendly navigation that makes it easy for your employees to find the information they need. Task testing (also referred to as Tree Testing) is a popular tool for building an intuitive intranet information architecture (IA). It’s a quick process that typically follows card sorting in the series of steps for designing a user-centered intranet navigation. Task testing fills a critical role that card sorting doesn’t: it evaluates the findability of content. If you are committed to building a user-friendly navigation for your employees, you need task testing. Like intranet card sorting, task testing doubles as a user engagement opportunity and can help build a foundation for sustained intranet adoption. Task testing assesses how well a site navigation matches users’ perspectives. It answers the question, “Can users navigate the new sitemap to easily find the information they need?” Intranet teams typically use task testing after creating a proposed sitemap, which is based on completing a content audit and card sorting. Task testing is implemented using a simplified mockup of a site’s draft navigation. An intranet team comes up with specific tasks related to information on the intranet and participants identify where they would expect to find the information. For example, you just returned from a business trip and you need to document your expenses and submit them for reimbursement. Where would you expect to find the necessary information? A participant would then click through the navigation mockup looking for the correct content to complete that task. The point is to gauge how well the navigation labelling and organization helps participants complete tasks. It’s important to note that the participant is never wrong, and low success rates in testing convey weaknesses in the navigation’s design. Why is task testing important? Like card sorting, task testing helps build an intranet navigation structure using terms and groupings that match users’ perspectives. Unlike card sorting, task testing validates an information architecture and provides feedback on how to improve it. Task testing lets you know whether your site navigation makes sense to users in real-world contexts, rather than just from an abstract perspective of organizing information. It evaluates if participants can browse to find information, rather than relying on search. Whatever content you put on your intranet, you must consider why it is there, what tasks employees are trying to complete, and how to facilitate an easier and faster task completion. Finally, the more you engage your users in building a new intranet, the easier your road to adoption. The engagement builds excitement and shared ownership, and the usability improvements make the new intranet easy to use. There are many ways to conduct task testing. These include using hard copy index cards, simple HTML mockups, live intranet software with a draft navigation already built, or using online task testing software. The easiest approach is to use online task testing software. We rely on Optimal Workshop’s online TreeJack tool. Online task testing lets you engage a geographically dispersed audience easier than hard copy, in-person task testing. It also offers greater flexibility and built-in analysis. Most of our clients have short timelines and limited resources so we often implement only online task testing. Because of this experience, and its benefits over hard-copy task testing, we only cover online task testing here. Not all employees have the exact same perspective. The way people see and use a specific piece of content may vary based on their job levels, departments, locations, etc. It is, therefore, important to involve employees who span the spectrum on a number of different criteria. Consider things like hierarchy, location, department, and role. We recommend a minimum of 50 user testers for task testing. The whole point of task testing is to validate a draft intranet site navigation. That draft navigation is typically produced through card sorting. To properly conduct task testing, you need to clearly document the assumptions that resulted from card sorting. You’ll use those assumptions to build the draft site navigation. For example, what clear content groupings did you observe in the card sorting results? How did you translate those observations into a draft site navigation? No matter how you’ve drafted your site navigation, document your assumptions and finalize an official first draft of the navigation that you can use for task testing. You’ll need a minimum of two levels deep of navigation, with a third level of navigation in at least some areas of the sitemap. It’s critical to clearly document uncertainties and questions that arise from card sorting. Together these form the basis for the tasks you select for the task testing exercise. Task testing is directly linked to card sorting because it is used to test and validate the assumptions and questions that resulted from the card sorting exercise. For example, the results of card sorting may suggest that top-level navigation sections such as “About the company” and “Administrative tools” would make sense to users. But card sorting may have also shown that “Branding guidelines” didn’t fit conclusively in one of these groupings. So with task testing, you would aim to test which location worked better. You could do this by placing “Branding guidelines” under “Administrative tools” in the navigation tree and creating a task around finding that information. The task testing results could illuminate whether or not that location for that information makes sense to users. Start your task testing project by listing the key issues with the draft navigation around which you feel the most uncertainty. Alongside those issues list the key assumptions you’ve made about how content should be grouped. An example assumption might be that users grouped most HR-related topics together in card sorting, so you need a top-level navigation item for all HR content. That’s a common assumption, but you may still want to design a task that tests this. From your list of questions and assumptions make a final list of 8-10 issues to test. You will base your tasks on these issues. For each of the 8-10 issues, plan to test write out a task scenario. A task scenario explains a real-world situation which would require an employee to complete a specific task using information on the intranet. For example, if you want to test the concept of an “HR” section in the global navigation, you could create a task related to a common activity such as annual performance reviews. This example lays out a very specific HR-related task, but it isn’t about that task. It is about whether or not the “HR” term in the global navigation will resonate with users when they are looking for the type of content you plan to put in that section. In order to test that broader navigation scheme, you need a very specific real-world task that makes sense to users. 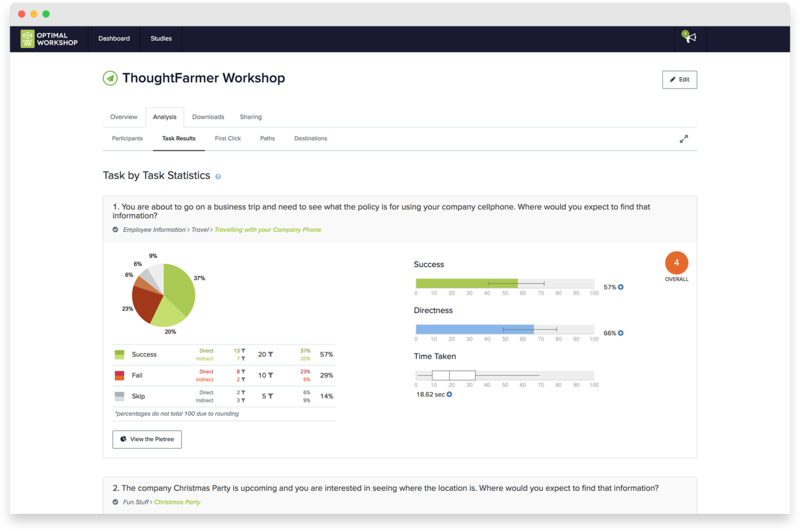 Each of the task scenarios you write should be universally relevant to all employees. You can’t create a “sales” related scenario if some of the testers have no involvement with the sales process. 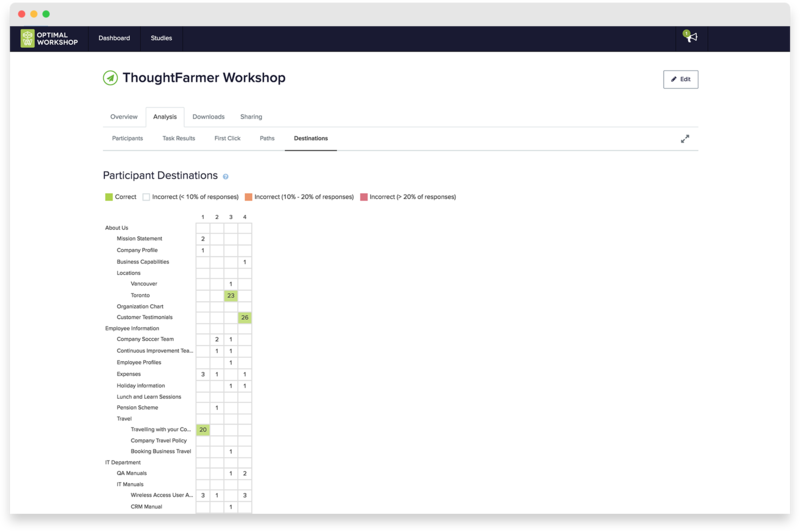 Once you’ve come up with 8-10 task scenarios, identify the location within your draft navigation where you will put the correct content for each scenario. You might complete this as part of STEP 4, but being clear about the location of the correct answers is important enough to warrant its own step. Using the HR example listed in STEP 4, you might note that the correct content would live under: Home > HR > Performance Management. As you are completing STEP 5 you might discover holes in your navigation. Perhaps as you write out real-world tasks you notice that some important content is not included in your draft navigation. This happens because the results of card sorting may not lead to a complete site navigation. The process of creating an intranet IA is iterative by nature. Discovering holes while you prepare for task testing can be very helpful. Before you set up your online task testing, review each of your task scenarios for words that match the terms in the draft site navigation. Removing leading language from your task scenarios may require restructuring sentences and will require some creative thinking. This effort can actually help broaden your perspective on the information on the intranet and see it through the lens of a new hire. TreeJack and any other well designed online task testing software will let you build a draft site navigation that users can click through. You must build your draft site navigation here before you create your tasks. Once you’ve created the navigation mockup in your online software, you can add tasks. For each task, you will type in the text of the task scenario and then select the location in the navigation where the correct answer lies. After creating a navigation mockup and adding tasks, you’ll be ready to start the online task testing. Agree with your team on the time when you will run the task testing exercise, then set it “live” in the online software. Depending on how responsive your users are, you may collect enough responses within just two days. Or you may need to leave the task testing open for a week to accommodate employees in other countries. As with other IA techniques, task testing analysis is both an art and a science. 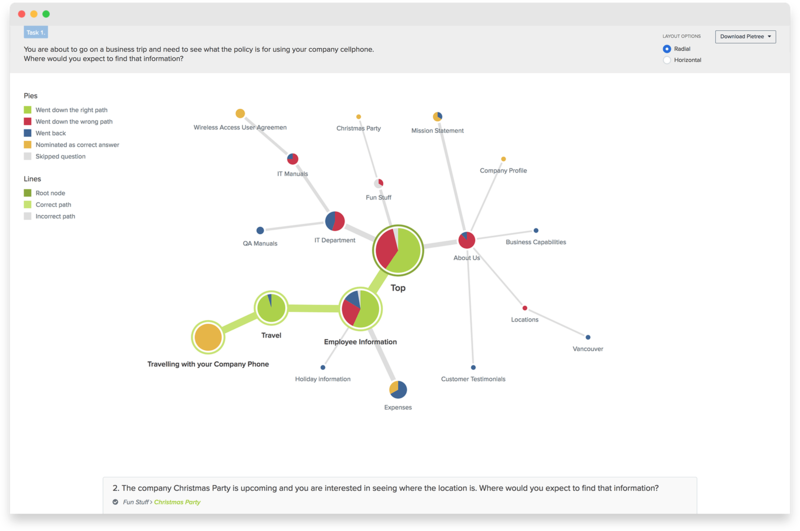 The sophisticated data visualization tools available in online task testing software make it easy to complete. However, you’ll still have to make assumptions about what the results mean and how to address problems. At the most basic level of analysis, you’ll be looking for agreement among users. How many testers succeeded in the task and how many people selected the correct location within the navigation? To respond to low success rates for a task you may have to change the wording of one or several navigation sections. You may have to restructure the navigation by moving sections, re-grouping content, or even changing or adding to the global navigation. Or perhaps you need to cross-link between different sections that hold related content. Once you have analyzed the results and adjusted your navigation, you can either move on with your intranet project or conduct another round of task testing. Because online task testing is quick and easy to implement, you can run several rounds and keep making adjustments. Task testing success is in the details. If the assumptions about your draft navigation aren’t clear, the purpose of the task scenarios you use will be unclear and the results inconclusive. If the tasks are worded poorly they may give away answers and skew results. Finally, if not combined with effective content audit and card sorting efforts, you may not see the full potential of task testing. Regardless, any intranet team, no matter how small, can implement task testing and gain valuable insights into employees’ perspectives. The resulting improvements in usability will be worth the effort.